With the foreclosure crisis past, why are foreclosures rising? The financial media perpetuated the fantasy that the foreclosure crisis is past. Now, can-kicking ends and foreclosures rise once again. The foreclosure crisis never ended, it was merely delayed by lender can-kicking. Bankers designed policies to promote loan modification over foreclosure, specifically to drive down the reported delinquency rates. Further, HUD sold off non-performing loans to hedge funds that don’t report their delinquencies, which also lowers the reported rate. Lowering delinquency rates should be a big plus; however, lowering delinquency rates through methods that don’t permanently cure the loan (can-kicking) is a farce designed to influence public perception. Lenders want to report better delinquency rates to improve confidence in the housing market to encourage buyers to bid up prices to aid lenders in their capital recovery on their bad loans. Politicians want HUD to report better rates purely for public relations benefits to improve their approval ratings. In other words, lenders and politicians lie to the public for self-serving reasons. The financial media goes along because they gain more readers by providing false emotional support to people seeking reassurance rather than providing hard facts and accurate analysis. Unfortunately, people often make important and complex financial decisions based on erroneous or biased information they obtain from the financial press. When these investment decisions go bad, people are often wondering what went wrong. The problem is they suspended rational disbelief and trusted the veracity of what they read in the mainstream media. So what do you get when lenders and politicians collude to peddle a lie through the mainstream media? The illusion that the foreclosure crisis is past. Mortgage delinquencies and foreclosures will rise again, and they will remain elevated above historic norms for much longer than anyone currently anticipates. This will “surprise” economists and others who accept the financial media spin without understanding why and how the mortgage delinquency rates were lowered in the first place, through temporary measure and can-kicking. Despite reports to the contrary, permanent loan modifications did not permanently solve the delinquency and foreclosure crisis. The next wave of foreclosures won’t be as damaging as the 2008 tsunami. The whole point of lender can-kicking was to meter out these foreclosures over time, and in that regard, they succeeded. We likely won’t see substantive price declines from the upcoming REOs, but it will be welcome added supply that may help sales volumes. Six years after the housing bust, lenders are still offloading homes that have been in foreclosure limbo. And they’re stepping up their efforts. Notice that Los Angeles, San Francisco, and San Diego all have year-over-year increases in foreclosure activity. The reasons behind the uptick in auctions are slightly different in every state, said Daren Blomquist, a vice president at Realty Trac. But the underlying theme is that banks are finally getting around to clearing a backlog of foreclosures that have been delayed. Some of the delays were in states that require a lengthy court approval process for every foreclosure, such as Maryland. In other cases, states passed laws to slow down the foreclosure process or lenders bungled their handling of foreclosure documents. Some of the nation’s largest banks reached a settlement with state attorneys general to address those practices. Some of the increase is also caused by hedge funds buying non-performing note pools. These investors are either fix-and-flip investors buying because the discounts are steep, or sometimes it’s REO-to-rental companies looking for an inexpensive source of new rental units. In either case, these hedge funds generally move quickly to foreclosure so they can extricate the former owner and either flip or rent the property. Separately, lenders also had an incentive to delay, said Greg McBride, chief financial analyst at Bankrate.com. They were basically waiting for home prices to rise, as they have in the past two years. That way they could get a better return on those homes, McBride said. One of the few acknowledgments of can-kicking I’ve read in the mainstream media. While there is no longer a deluge of foreclosures hobbling the housing market, the auctions that are underway are a reminder of the residual effects of the crisis. “The rise in foreclosure auctions indicates that the banks and the courts are preparing for a spring cleaning,” Blomquist said. The headlines in the financial media give the false impression the foreclosure crisis is past. It’s not. Millions of borrowers are not paying their mortgages, and millions more are making partial payments on doomed loan modifications. The banks bought time with loan modifications, but this was a temporary measure that allowed them to better manage their REO inventories and delay final resolution on their bad bubble-era loans. The day of reckoning, though delayed, has finally arrived, and banks are increasing their foreclosure processing to finally clear out the trash. Home affordability continues to challenge first-time, young and middle-class buyers, with some of the warmer climes generally making for the hottest – and least affordable – housing markets. But good news if you like the cold – the most affordable markets are near the Great Lakes. That’s the summary from Jed Kolko, chief economist for Trulia. Nationally, Kolko says, 59% of homes for sale are within reach of the middle class, compared with 62% last October. Six of the seven least affordable markets are in California. A middle-class household can afford just 15% of homes for sale in San Francisco and 22% in Los Angeles. In New York, only 25% of homes for sale are within reach. Joining the least affordable list for the first time are Austin and Miami. In Austin, just 40% of homes for sale are within reach of the middle class, down from 50% last fall. Miami has seen a similar drop in affordability. In total, in 20 of the 100 largest metros, middle-class households can afford fewer than 50% of homes. What happens when rates rise and people are already feeling stretched? My guess is he would prefer not to answer such an uncomfortable question because the obvious answer is that either prices will drop or sales will drop further, and neither alternative is palatable. Monday’s report shows that the financial health of the regulating agency improved dramatically but that it still has a way to go with its finances. The FHA boasted a $21 billion improvement since late 2012, after implementing a series of financing changes. Ed Pinto, codirector and chief risk officer for the International Center on Housing Risk at the American Enterprise Institute, said that the report shows slow but steady progress, largely due to past increases in FHA premiums. Since FHA’s financial future is still uncertain, Pinto argues, now is not the time to reduce premiums. It has nowhere near the level of reserves to withstand even a minor recession. Pinto said that even if FHA’s projection proves to be correct and it reaches 2% in economic capital by the end of FY 2016 (and there is not an intervening recession), the current recovery will be quite old at nearly seven-and-half years old. An economic capital level of only 2% would prove to be woefully inadequate to protect the taxpayers, Pinto said. “It would more likely need 5-7% or more. Both the House and Senate committees have reported out bills that would raise the 2% level. Given FHA’s current high-risk practices, it would be imprudent to not stay the course; it should not lower premiums,” he said. Emulate the risk management practices of the VA. The VA charges about ¼ of the premium charged by FHA. This is in large measure due to practices like calculating ability-to-repay using the residual income method, risk sharing, and improved appraisal practices Regarding FHA’s resistance to using residual income, it is clearly out of the mainstream of sustainable lending practices. In a recent survey of 30 large and medium sized released by Tom LaMalfa, an industry consultant, 26 said FHA should implement residual income. Taking these steps would allow the FHA to safely reduce premiums in the future, while protecting homebuyers and taxpayers. Focus more on wealth building through homeownership. The 15-year Wealth Building Home Loan is a big step in the right direction and should be considered by FHA. None of that is what the Community Home Lenders Association would like. The CHLA renewed its call for the FHA to reduce premiums straight up. I am amazed at the silly ideas that get funded. That explanation provided no clarity on what RealScout does or what value they bring. If they’re trying to make it easier to sort homes based on meaningless descriptors like “gourmet kitchen,” somebody better kiss their $6 million goodbye. Yeah, last I checked that was already a feature of many RE websites. Mortgage delinquencies continued their downward trend and fell to 3.36% at the end of the third quarter 2014, decreasing nearly 17% in the last year, according TransUnion’s latest mortgage report. This is the eleventh consecutive quarter of declines thanks to a continuing clearance of the foreclosure backlog and a steady rise in home values. “While mortgage delinquency rates remain elevated relative to historic norms, they are steadily improving,” said Joe Mellman, vice president in TransUnion’s financial services business unit. “New mortgage cohorts over the past several years have been squeaky clean from a risk perspective. This fact, combined with the continuing clearance of the foreclosure backlog and the gradual but steady rise in home values, serves to drive the ongoing trend toward lower mortgage delinquency rates overall,” Mellman continued. Broken up, the nation’s largest markets recorded some of the biggest mortgage delinquency rate declines. Between third quarter 2013 and third quarter 2014, Miami (-31.6%), San Francisco (-28.6), Phoenix (-27.1%) and Los Angeles (-24.2%) continued to experience major improvements in delinquency. Only two of the largest markets did not have double digit declines: New York (-9.9%) and Philadelphia (-9.4%). Remember the fanfare around Mel Watt’s announcement of looser lending standards? As federal housing agencies push mortgage firms to lend to more consumers, a recent survey indicates most lenders feel the regulatory risk is still too great for them to lower their standards. In a poll conducted by the Collingwood Group throughout October, 71 percent of mortgage lenders said the odds of them lowering credit score requirements for borrowers are between “somewhat” and “extremely unlikely,” with several saying they feel their standards are already relatively low and that they generally follow the credit parameters set by agency investors. As homeownership numbers sit at their lowest level in nearly two decades, regulators have recently announced plans to boost mortgage availability by allowing the GSEs to purchase loans with lower down payments and by clarifying their repurchase framework. Despite those steps and the strain some originators are feeling as the mortgage market shrinks, one anonymous respondent commented that “[i]t isn’t worth the business risk” to relax their lending criteria. “The reluctant to broaden the credit parameters to reach additional borrowers is a clear indication that lenders are passing up additional volume to avoid regulatory enforcement actions,” the Collingwood Group said in a report detailing the survey findings. Out of all the regulatory worries contributing to lenders’ anxiety, the Consumer Financial Protection Bureau’s (CFPB) mortgage rules are the biggest concern, the survey shows, with 74 percent of respondents pointing to the bureau as the biggest source of concern. Also on the list were Fannie Mae and Freddie Mac, Federal Housing Administration program requirements, and state regulations, with each earning single-digit shares of responses. In their views of CFPB, many originators questioned whether the bureau’s rules are actually in American borrowers’ best interests, and some said they feel the agency is too focused on finding faults and fining companies rather than offering guidance. In response to the new regulatory environment, 82 percent of respondents reported their companies are taking expansionary actions, including increasing compliance staff, enhancing risk controls, and investing in compliance technologies. Another 9 percent said they are taking the opposite strategy by reducing third-party originations and tightening credit standards. At least one lender remarked that his or her firm has left the residential mortgage business altogether, the Collingwood Group reported. I think this is one of the few fair criticisms of the Bureau. There are a number of areas where they could provide precise guidance to prevent undesirable behavior, but they choose not to do so. I harp on it too frequently, I know, but the Bureau could publish guidance tomorrow that creditors may not charge discount points without actually reasonably discounting the rate (25 bps rate reduction per discount point charged). Instead, they’re silent. They’ll likely complete an enforcement action a year or two from today, fining some creditor millions for this activity. Yet there will still be no affirmative guidance – just an example of the most egregious practices. I wonder if this silence is intentional. They leave the entire industry in fear, which makes them prudently conservative, and they can let the courts decide. You’re right about the can-kicking too, but I’m not so sure that the banks are ready to clear the books just yet. This thing is going to drag out forever.. 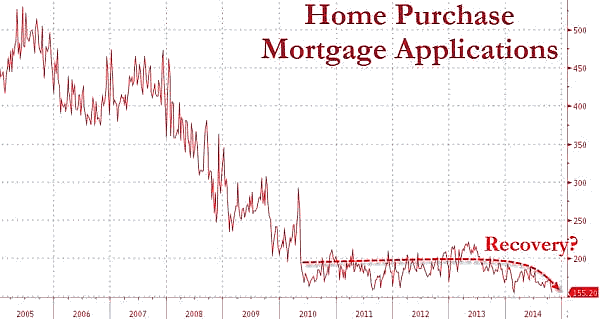 The banks now want to get top dollar for houses that have been sitting around for 3 or four years collecting dust. I know. I just bid two of them, both of which were denied at auction because the high bid didn’t cover the reserve requirement. What a joke, eh? The banks don’t like the way the auction turns out, so they take their marbles and go home. And you wonder why people hate banks? Lenders will continue to meter these out slowly to avoid a crash, but as I’ve been saying for years now, this overhead supply is going to prevent any substantial appreciation. I thought it would be off a lower base, but I underestimated the ability of lenders to restrict supply and reflate the old bubble. I would never bid at a reserve auction. They are merely hoping for an auction frenzy to get people to overpay. There are no real bargains due to the reserve requirements. Real foreclosure auctions don’t have reserve prices (they have bank opening bids, but these are limited to the outstanding loan balance). The only real bargains are found where reserve prices are absent. I don’t know if that’s fair. I want to sell something, but not below a certain dollar amount. Is it rude that I reject your offer below my floor? In a normal asking price situation no, but in a supposed auction situation yes. An auction by its nature is not supposed to have a reserve price. Anything else is merely a disguised sale. Same answer as every other real estate phenomenon right now. Prices went up, a lot. A simple yet powerful truth. Apparently, penalties aren’t high enough to deter lenders from this behavior. SSDD. This article mirrors a recent article in the NYT about robo-signing. I am using that article in a post this week. IMO, they are resurrecting the same false claims about robo-signing brought up years ago. Nobody who is paying their mortgage lost their homes in foreclosure, and people who aren’t paying their mortgage should lose their homes in foreclosure. The whole robo-signing controversy was a smoke screen designed to divert attention away from the fact that the people losing their homes were not paying their mortgages. Nonetheless, to maintain the status quo requires full faith in the system, and faith continues its epic plunge. Great chart! We will probably see another 20-year low in purchase mortgage originations this winter. Sorry Larry, but in the past you’ve reamed bullish graphs for collapsing the scale to make imperceptible changes, perceptible. Same standard should apply here. Comparing to peak demand with a collapsed scale, and then accentuating that with a bolded red arrow pointing down, makes this trend almost seem significant. It’s data manipulation 101. True, but you must admire how well that particular chart is done. Well, I prefer the truth to pretty charts, but I know I’m in the minority there. The data is still accurate, only the perception of the meaning of the data is influenced by the presentation. The fact remains that purchase originations are about to make a fresh 20-year low. “Collapsed scale” ?? LMAO! FAIL!! Uh… that chart simply plots actual purchase app activity being reported, according to the Mortgage Bankers Purchase Index. Still not much of a “recovery”. Since the peak of last Summer, the trend is down to levels last seen in ~1996. It doesn’t look any more bullish when the scale isn’t changed and the arrow isn’t added. Where are the socialists (who were commenting a few days ago on a post) to defend this accusation? Robo-signing is the fruit of the poisonous tree and should result in all affected borrowers receiving free homes! Unemployment reporting is a statistical lie so transparent it’s truly laughable. The October 2014 Employment Situation Summary released by the U.S. Bureau of Labor Statistics (BLS) on November 7 reported a nationwide unemployment rate of 5.8 percent, the lowest level in more than six years. That unemployment rate might be somewhat misleading, however. A report released recently by the Pew Research Center indicates that while the U.S. unemployment rate is low, the number of people who are “not in the labor force,” meaning they are not counted among the unemployed in the BLS survey, is near an all-time high. BLS reported that about 37 percent of America’s civilian population, or about 92 million people, currently belong in the “not in the labor force” category because they are not employed and have not searched for work recently, therefore they are not considered unemployed by the BLS even though they don’t have a job. About 93 percent of those not in the labor force, or 85.9 million, were not in the labor force simply because they did not want a job, the BLS reported. While some have speculated that large numbers of retiring Baby Boomers are responsible for the spike among individuals not in the labor force, the BLS found that an increase in the percentage of young adults between the ages of 16 and 24 who don’t want a job is largely responsible for the increasing numbers of those not in the labor force. The percentage of individuals in that category has risen to 39.4 percent for the first 10 months of 2014, whereas it was 29.5 percent as recently as 2000. The BLS reported a much smaller increase in that category among adults ages 25 to 54 (16.9 percent) and a decline in that category for adults ages 55 and older (58.2 percent). BLS disclosed in the October 2014 employment report that the number of people “marginally attached” to the labor force had slightly declined from September down to 2.2 million. Someone who is marginally attached to the labor force is currently not employed but available for work and has searched for a job in the previous year, but not in the previous four weeks, according to the BLS. Marginally attached workers are not considered unemployed by the BLS. We won’t reach a bottom in gold until Peter Schiff capitulates. Gold for the rulers, paper for the serfs. The rulers not only didn’t see the epic collapse in gold coming, but they rode their bubble losses all the way down not believing that they could be duped so easily. I wrote recently that pressure would mount to reduce the FHA insurance fees. Apparently, Republicans will resist any lowering probably through 2016; therefore, expect home sales to remain weak and the first-time homebuyer participate rate to remain low. Despite the Federal Housing Administration showing improvement in its financial house, it’s unlikely FHA mortgage insurance premiums will be going down in 2015. On Monday, the FHA released its actuarial report on the Mutual Mortgage Insurance Fund for single-family programs, and while the health of the regulating agency improved, it still has a way to go with its finances. The report served as Rorschach test, with those on the left and right, and those in the industry and those advocating for fair housing using it to bolster their disparate agendas. “Given that the FHA’s flagship fund – the Mutual Mortgage Insurance Fund – is expected to remain below the Congressionally-mandated 2.0% threshold until October 2016, a decision to lower FHA premiums in 2015 would undoubtedly be met by considerable opposition from Congressional Republicans,” says Lauren Burk, analyst with Compass Point Research & Trading. “Specifically, we believe that House Financial Services Chair (Jeb) Hensarling, R-Texas, and likely Senate Banking Committee Chair (Richard) Shelby, R-Ala., would publicly and aggressively attack a move to lower FHA premiums in advance of the MMIF clearing the 2.0% threshold,” Burk says. Burk was on the money as not long after her client note, Hensarling publicly attacked the FHA for again failing to meet its capital ratio requirement, and said he would stand athwart any attempt to lower premiums. “A year ago the FHA received its first-ever taxpayer-funded bailout and 12 months later the FHA has once again failed to meet its legally required minimum capital ratio. It’s been six years since the FHA was in compliance with the law,” Hensarling said. “The Obama administration predicts it will finally meet this requirement by 2016, but we’ve heard similar rosy predictions about FHA finances for years. Burk says any attempt to lower premiums faces an uphill battle. Just two years ago, the administration extended the charge to homeowners for the life of the loan. In my personal opinion, one of the reasons why foreclosure has not really declined and will continue to arise despite homeowner’s not being educated as to what their options are is that homeowner’s simply have gotten used to not paying their mortgage. I mean just taking a step back, when you go on vacation and you come back to work that day of work seems like the hardest. It is the same when paying your mortgage. Some of these homeowner’s have not paid their mortgage in so long that they don’t even want to pay. I do also believe that some of them are just waiting until they have to move out. I work for a mortgage servicing company and I received a call from a guy asking me if we knew the exact day of when his house was scheduled to sale for foreclosure. I asked why and he stated because that was his occupation to buy houses when they auction.